That sounds elegantly minimalist in a way I can only dream of. I also had a study/den, but was too dark so moved out (it’s now exclusively the music room). There is something to be said for needing to tidy away each day – sometimes my desk is so cluttered I move operations the conservatory to actually be productive. The idea of reorganizing a workspace has, at least in my mind, less to do with achieving a more organized workspace then it has to do with starting afresh in order to somehow get a new or different or fresh look at the work at hand. I consider it important to maintain a cluttered workspace so there is always something available to reorganize anytime you need to do it. Back in the 80s I had a habit of doing a twenty minute studio clean-up before every painting session. It was my way of settling in to the right mindset to get to work. Also as a painter, I am not above turning my painting upside down or looking at it through a mirror, or even hiding it away for weeks so that I can look at it with fresh eyes much later. It’s all part of the same thing. Also important is having workspace clutter contain some good distractions in case things are going badly and distraction becomes important. You have a capo on your desk. I’m sure the instrument you use it with is not far away. Playing music is an excellent way of avoiding doing almost any other work. 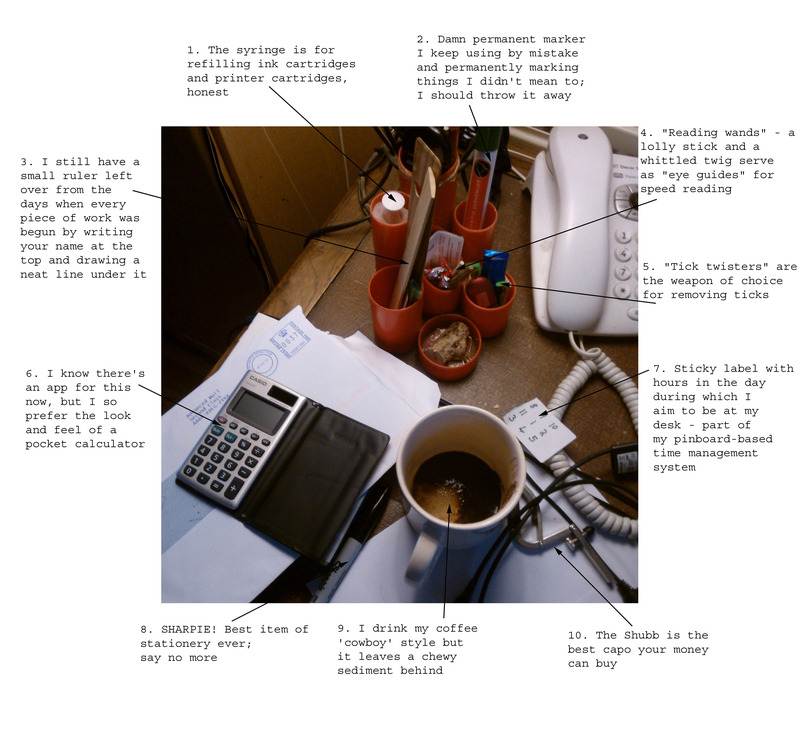 “Tidying up the workspace” is also an excellent way of avoiding work. I think it does help to have a sort of “set up ritual” in order to sidestep the inertia around actually starting a task. I have a “grasshopper” approach to creative work: I fiddle with it and then become distracted, walk away, do something else, come back and fiddle with it some more – sometimes leaving and returning to it up to three times an hour. Nevertheless, during the time when I am not working on something (but playing the banjo or hanging out the laundry), my subconscious is still enagaged with the original task – so I come back with that freshness you speak of. Every time I hit a snag, I tend to walk away and do something else, nowadays. There is a great passage in “Zen and the Art of Motorcycle Maintenance” about this approach to problem solving. The problem of course is getting too interested in all those “something else” activities. I have a tendency to not get “a little” involved in anything. Instead, I tend to throw myself headlong into whatever I’m doing, resulting in getting more deeply involved in more things than my time can support.